Count me among the many meat-eaters that love pork…the flavors, the succulence, the aroma as it cooks…I do love a good hunk of pork! And is it really all that bad for you? The recently shelved “other white meat” campaign would have had us believe it is no worse for you than chicken. While it’s true, there can be about the same amount of fat as chicken, there can also be a significant amount of calories from fat depending on the cut. In my wiser years I have naturally become more conscious of my eating habits. I hardly ever eat bacon anymore and practice moderation when it comes to all things pork. Believe it or not, I only cook pork twice, maybe three times a month. Even so, the reason it shows up on my blog quite often is because it is indeed one of my favorite things! While I do make a habit of choosing the leaner cuts, country style pork ribs generally isn’t one of them. I think I actually got a little giddy when I found these nicely lean boneless ribs at Aldi last week. I picked them up and excitedly anticipated giving them a try. With the long cooking of the braise they came out wonderfully tender, had only a little line of fat along one edge and the flavor was chock full of porky goodness! I have discovered that grating the garlic on a microplane creates an intensely garlicky flavor, so much so that I only used about half the garlic I used to use. Speaking of flavor, the browning in this recipe gives it a nice head start and the tomatoes and the wine contribute to both flavor and tenderness. Lastly, covering the pan with foil creates an extra good seal to prevent moisture loss and helps retain all that good flavor. 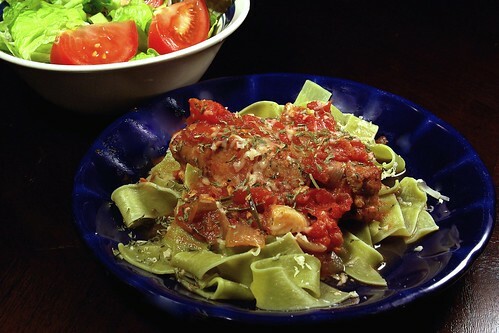 I served this dish over spinach pappardelle; the wide noodles did a good job of collecting all that sumptuous sauce. You could also use egg noodles, ziti, or rigatoni. Preheat the oven to 325 degrees. Heat 2 Tablespoons of olive oil in a Dutch oven or a large heavy bottomed pan over medium high heat until almost smoking. Season the ribs well on both sides with kosher salt & fresh ground black pepper and sear until well browned on all sides (about 10 minutes over all). Set ribs on a plate to return to the pan later. Add onion, celery, carrot, garlic, and herbs to the same pan and cook stirring often until the onions become transparent, about 6-8 minutes. Add the wine to the pan and stir to loosen any browned bits. When the wine has reached a rapid boil add the tomatoes and the juice from the can, gently crushing them as you add them to the pan. Return the pork to the pan nestling the ribs into the sauce, bring to a light boil then cover the Dutch oven or pan with aluminum foil. 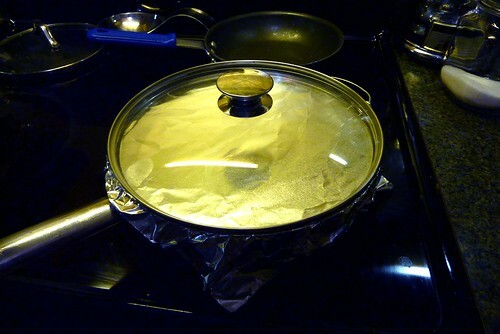 Place the lid on the pan pressing to seal it well then flatten the foil around the sides. Bake 1-1/2 hours and allow 15 minutes rest before serving. Garnish with grated Parmesan cheese. This entry was posted in Entree, Pasta, Pork and tagged Braised, Country, Garlic, pasta, Pork, recipe, Recipes, red, Ribs, Style, tomatoes, Wine. Bookmark the permalink. Oh man! That looks delicious! YUM ! … another wonderful recipe from Randy the Wonderful Chef!